We can find and run Report Server Configuration Manager on the Windows start screen. Click Report Server Configuration Manager. In the main tab of configuration manager, we can start and stop Report Server service and at the same time we can find out Report Server edition, product version and other main information about SQL Server Reporting Service. Service Account: In this tab, we can configure Report Server Windows service account. In the built-in account selection box; we can find Network Service and Virtual Service Accounts. These accounts have minimum privileges which they require to run Report Server and have network login permissions. Microsoft recommends that if we don’t have any domain account we can use a Virtual Service Account. Because this account allows us to avoid password expiration or Report Server breakdowns, but if we have a domain account we can create a dedicated account for Report Server and can customize required security policies to this account and can use this account to run Report Server. Can change virtual directory name for the ReportServer. Default virtual directory name is ReportServer. Can bind and configure SSL (Secure Sockets Layer) certification. Database: The Report Server database stores all report contents, subscriptions and other several data (Dataset, Data source, Roles etc.) which required by Report Server. In this tab, we can configure the Report Server database connection login and password setting. In the default Report Server installation, two databases are created which are named as ReportServer and ReportServerTempDB. At the same time, this tab provides us to change Report Server database. In Report Server database, we can find a handy view which is named as ExecutionLog2. This view helps us to find out usage frequency of reports, execution times and what parameters are used in the reports. By default, this log is kept for 60 days. We can change this setting to connect SSRS instance with management studio. 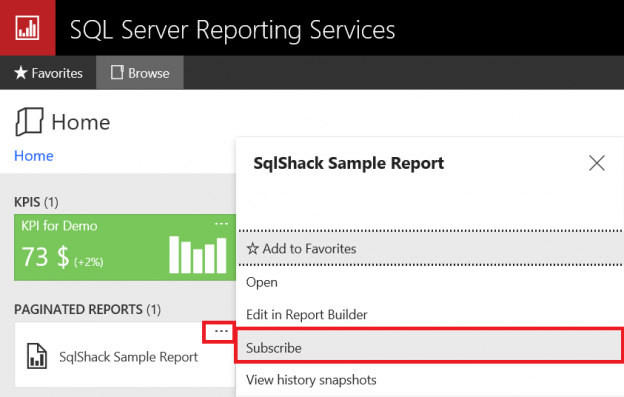 Right click on Report Server instance and select Properties. Click Logging tab and change default number. In this tab execution logging option can disable. Web Portal URL: In this configuration tab, we can configure web portal virtual directory name and we can change request ports and filter IP address like Web Service URL. After completing all these steps about email subscriptions, Report Server will create a job on SQL Agent. If our SQL Agent does not run, we get an error about this. When we look at the SQL Agent jobs we can find out a job which represents Report Server email subscription. At the same time, we find some information about this job in Report Server database, the below query returns the following information about subscription. At last, you can find logs of subscriptions in My Subscription page. Encryption Keys: In this configuration page, we can find out encryptions keys configurations. Encryption keys are most important for Report Server stored connection strings and other sensitive data in Report Server database and this data is encrypted by these symmetric keys. For this reason, our first task after the installation of Report Server should be the backup of this encryption key. Because when we need to move or change the location of Report Server location. This encryption key provides us to recreate connection strings username and password successfully. If we delete the encryption key Report Server it will clear all connection string usernames and passwords and other sensitive data. We will need to redefine this data. Subscription Settings: We mentioned about file subscriptions under the email set heading. If we don’t set this setting, the Report Server tries to access file paths with their service account privileges. But in some special security policies service accounts cannot access defined file subscription keys. To handle this issue, we can use file share account. This setting allows us to use different accounts to access file paths. SQL Server Reporting Services provides us with several configuration settings. With these settings, we can customize Report Server and adapt it to our business requirements. If you ask my opinion SQL Server Reporting Service is an advanced solution for reporting and business intelligence.